Game Night review: "A better-than-expected comedy, directed with irreverence and flair"
A better-than-expected comedy, directed with irreverence and flair by the future Flash guys. Picture a remake of David Fincher’s ’97 gem The Game, orchestrated by the deviant minds behind Horrible Bosses, and you’ll immediately get the measure of Game Night. A cut above most recent assembly-line comedies, John Francis Daley and Jonathan Goldstein’s high-concept caper has a cast loaded with star players, and a gag count that puts it firmly at the top of 2018’s leaderboard. Alas, diminishing returns kick in when the rulebook goes out the window. Opening with an energetic meet-cute in the middle of a pub quiz, it stars Jason Bateman and Rachel McAdams as Max and Annie, an ultra-competitive couple who host regular game nights for their friends where, er, charades and Pictionary are top of the playlist. When Max’s high-flying venture-capitalist bro Brooks (Kyle Chandler) breezes into town, he promises to turbo-charge their evening with a murder mystery “so epic that we don’t need boards”. Believing Brooks’ subsequent kidnapping to be staged, competitors pair off to solve the ‘case’, but quickly discover it’s a game with very real consequences. 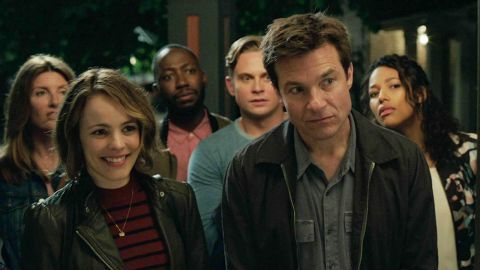 Laugh-out-loud funny for a respectable chunk of its runtime, Game Night is a near-guaranteed good time – a rarity among modern American comedies. Daley and Goldstein (who penned Spider-Man: Homecoming, and have DCEU standalone Flashpoint up next), balance crowd-pleasing larks with meta irreverence in a way that’s reminiscent of Phil Lord and Chris Miller, albeit never quite as sharp. Stylistically the pair also keep things fresh. Establishing shots captured with a tilt-shift-style lens give the world itself the appearance of a board game, as if the characters are pieces to be shuffled around. And there’s a dynamic, single-take action sequence involving a game of catch with a Fabergé egg that genuinely dazzles. Bateman could play sardonic beta male Max in his sleep, but is no less entertaining for it, while McAdams lends her natural warmth to the out-of-her-depth Annie. Catastrophe’s Sharon Horgan (sticking with her Irish brogue) makes a wryly funny addition to a cast of wisecrackers, but Jesse Plemons is the clear MVP as scene-snatcher Gary – the recently divorced neighbour who’s been shut out of game night, and will do anything to get back in. A dead-eyed delight, Plemons’ monotone delivery starts perplexing, becomes chucklesome and eventually causes hysterics with every syllable. A couple of late game rug-pulls provide a jolt, but it’s a film without the smarts to pull off such a tricksy narrative. Eventually sacrificing logic for spectacle, the script is so full of holes it must resemble a Connect 4 grid. And one character’s tendency to talk almost entirely in dated pop-culture references means his scenes largely miss the mark. Not a clean sheet then, but tot up the final scores and Game Night is a clear winner.